Tomorrow will be my 18th first day of school as a teacher. It will be the 8th for me as a parent of a child in school. My oldest daughter will start her first day of middle school (7th grade) and her sister will begin 3rd grade. 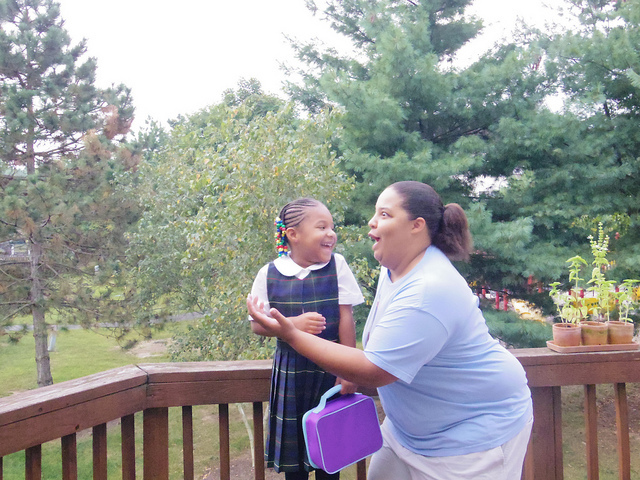 There are so many emotions around the first day of school and facing it as both and parent and a teacher intensifies that. My hopes and dreams for my daughters and my students all flow together into a swirling ocean of feelings. As I send my daughters off tomorrow a piece of my heart goes with them. I am entrusting them, and my heart, into the care of their teachers. I want their teachers to see their strengths and quirky wonderfulness. I want them to have friends they enjoy being with in their classes. I want administrators to smile at them and make them feel a part of the school community. I want them to laugh a lot. I want them to ask questions and be encouraged to do so. I want them to feel they own their learning. I want them to come home full of stories about friends, teachers, projects, lessons, and fun from their day. I want them to discover and read wonderful new texts of all sorts. I want them to see beauty in numbers and mathematics. I want them to have the opportunity and be encouraged to explore the world around them. I want them to make connections between all they are learning and discovering. I want them to overflow with joy from their days. This list comes from what I want for my daughters. I want the best possible school experience for them. The bar I set there then becomes my goal as a teacher. I want to provide for my students all that I hope for my daughters. They deserve no less. Image from roninzer0's flickr stream.